The last time we discussed the monarchy of Castile, Juan I of Castile’s son, Henry III, married John of Gaunt’s daughter Catherine. Henry III died in 1406, and was succeeded by his son, Juan II. Juan II married Maria of Aragon [the sister to Leonor of Aragon, King Afonso V’s mother]. Juan II and Maria had one child: Henry, who would become the aforementioned Henry IV. When Maria of Aragon died, Juan II married as his second wife Isabella of Portugal. Juan II and Isabella had two children: Isabella of Castile [the future patroness of Columbus] and her brother Infante Alfonso [infante meant prince]. Infante Alfonso was murdered in 1468. That left Henry IV with only one half-siblings, Isabella of Castile. Take a breath. To this point, Isabella of Castile was Henry IV’s heir to the Castilian throne. But wait. She is going to have to fight for it. Henry IV had no children by his first wife, Blanche II of Navarre. Their marriage was annulled in 1453. Henry married as his second wife, Joan of Portugal, King Afonso V's sister. [There is no point in telling you how else they were related]. The messy part is that Joan of Portugal, who, as Henry’s wife, became Queen of Castile, did some adulterous fooling around with a certain nobleman named Beltráin de la Ceuva. When Joan gave birth to a daughter, whom she named Joanna, it was generally thought Joanna was not Henry’s daughter. Joanna was known as Joanna of Beltráin. 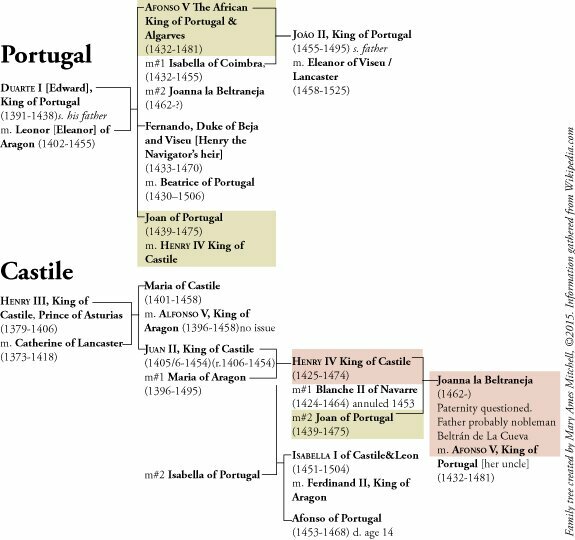 Here is a very abbreviated family tree [not all siblings are listed] of the Castilian and Portuguese monarchs showing these relationships. When Henry IV of Castile died in 1474, he had no male heir. Technically, his daughter Joanna of Beltráin would inherit. But since the populace thought that Joanna was not Henry’s natural daughter, a powerful group of Castilians sidestepped Joanna and placed Henry IV’s surviving sibling, Isabelle of Castile on the throne. Isabella had already married King Ferdinand II of Aragon in 1469. The couple were making plans to fuse their countries together to make Spain. But, whoops, Afonso V stepped into the drama and made things difficult. Afonso V was not happy that his niece Joanna had been passed over for the throne. After obtaining a dispensation from the Pope to marry a close relation, in other words his own niece, he married Joanna. Then he raised an army to contest Isabella’s place on the throne, claiming that he and Joanna were the rightful King and Queen of Portugal, Castile, and Leon. Isabella was recognized as Queen of Castile. Castile retained control of the Canary Islands. The Portuguese retained their monopoly of trade along the African coast all the way “to the Indies” and possession of all the Atlantic Islands and the surrounding fishing waters except the Canaries. All other ships wanting to sail south of the Capes Verdes Islands needed permission from the Portuguese. Infante João of Portugal [who was Prince João’s son as well as Afonso V’s grandson] was to wed Isabella of Aragon [Ferdinand and Isabella’s oldest daughter]. The important fact is that, except for the Canaries, Portugal possessed everything in the Atlantic all the way to the Indies. Portugal owned the unknown American continents. Afonso V, The African, lived only two more years after his war of succession ended. He retreated from public duty and let his son João run things. When Afonso V died in 1481, João officially ascended to the throne as João II. We invite your feedback. If you have any comments, suggestions, or corrections, please email them to Mary. Please tell me to which page you are referring. Thanks. ©2015 Mary Ames Mitchell. All rights reserved.